A closed fracture reduction is resetting a broken bone without cutting into the skin. The closed reduction may not be successful. Surgery may be needed to properly align the bones. 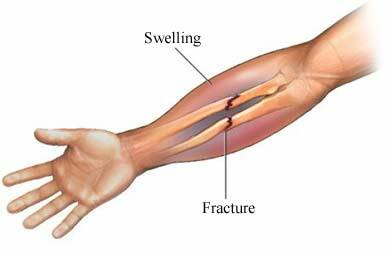 You may be given antibiotics if you have an open fracture. Your doctor will usually give you local anesthesia to numb the area. You may also be given a sedative. In some cases, general anesthesia will be used. You will be asleep during the procedure if this is the case. The bone fragments will be moved into their normal position. Traction will be applied and a cast or splint will be used to hold the bones in place. No incisions are needed. You will have some pain after the procedure. Ask your doctor about medication to help with the pain. You will usually be able to go home after the procedure. Small bones usually heal in 3-6 weeks. Long bones will take more time. Your doctor may have you work with a physical therapist. A physical therapist can help you to regain normal function. Broken bones. Kids Health—Nemours Foundation website. Available at: http://kidshealth.org/parent/general/aches/b%5Fbone.html. Updated August 2015. Accessed August 30, 2017.